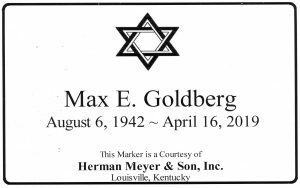 Max E. Goldberg, 76 – Herman Meyer and Son, Inc.
Max E. Goldberg, 76, formerly of Louisville, died Tuesday, April 16, 2019 in Indianapolis. He earned a Bachelors’ degree from University of Louisville after being stationed in Germany while in US Army. Max had a great aptitude for engineering, focusing his career as a pharmaceutical and medical engineer. Max dearly loved his family and is survived by his wife of 50 years, Susan Kohn Goldberg; his son Jeff and his wife, Stacey; and grandchildren, Alex and Hallie Goldberg. Memorial tributes in Honor of Max are welcomed to: American Heart Association, PO Box 15120 Chicago, IL 60693 or by phone: 1-800-242-8721 or to the National Kidney Foundation, 161 St. Matthews Avenue, Suite 3, Louisville, KY 40207.